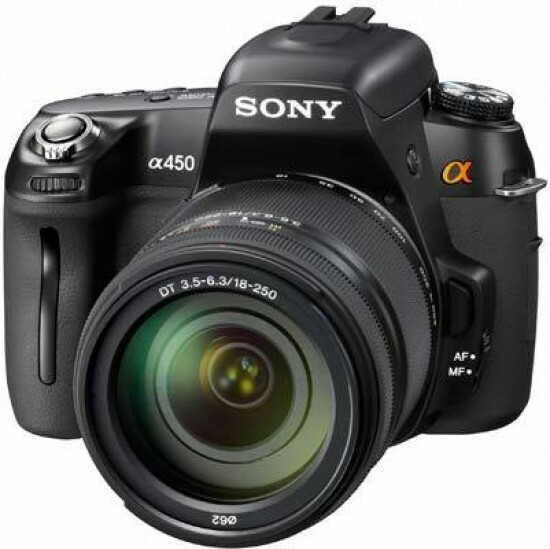 The Sony A450 is an eminently capable but rather uninspiring DSLR that feels like the stop-gap solution that it is, designed to hit a certain price point in the market. The loss of Sony's clever Quick AF Live View mode is a particularly bitter pill to swallow, as is the 2.7 inch screen inherited from the entry-level A230. On a more positive note, it does benefit from the excellent ergonomics, solid build quality and long-lasting battery life of the A500 series cameras. Equally excellent is the A450's image quality, with the 14.2 megapixel CMOS sensor and BIONZ processor combining to produce great looking images all the way up to ISO 3200. The Dynamic Range Optimizer reliably improves shadow detail and highlights, while the High Dynamic Range Optimiser combines two exposures into one image and produces quite natural HDR images (if you could ever call HDR images 'natural'). Sony has only recently promised to introduce HD video to its DSLR range, so it's no surprise to find that the A450 doesn't offer what has quickly become a standard feature on most rival products. It's obviously not a problem if you have no interest in using your DSLR for moving images, but Sony must be losing customers lured away by all the excitement surrounding video on a DSLR. Another criticism is the rather small and dark optical viewfinder - Manual Focus Check Live View partially alleviates this problem, but is no substitute for a better OVF. Which leaves the Sony A450 rather caught between the cheaper yet still capable A380, which does offer Quick AF Live View, and the more expensive Live View supporting A500 series models. The only camera in the A400 series is a solid but rather odd mix of features borrowed from across the Alpha range - we'd ultimately save some money and go for the A380 or splash out a little extra on the A550.